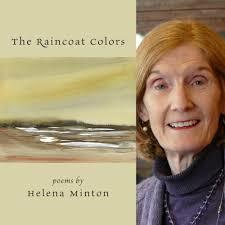 I’ve known Helena Minton since the 1980s, when she was publishing with Alice James Books, a collective effort to bring out the best new poetry, particularly by women writers. Her book The Canal Bed (1985) includes a long poem centered on the Middlesex Canal along with poems that range into different territory. She has always been a strong supporter of literary activity in the Greater Merrimack Valley and the region. Don’t be surprised if you see her at readings in Lowell, Gloucester, and elsewhere. Her recent chapbook or pamphlet is The Raincoat Colors (Finishing Line Press). Her poems are forthcoming or have recently appeared in The Listening Eye (as the feature poet); The Paddock Review; The Tower Journal; Ibbetson Street; and Nasty Women Poets: An Unapologetic Anthology of Subversive Verse (Lost Horse Press). In March, she will read in the Chapter & Verse reading series in Jamaica Plain, Mass. She has served on the board of the Robert Frost Foundation in Lawrence for many years. The Foundation’s executive director is Jessica Marie, who is a writer and the coordinator of administration and outreach at the Middlesex Community College Law Center. The Frost Foundation held its annual Community Read at the Lawrence Public Library on October 26th, with representatives from the Lawrence History Center, The Elevated Thought Foundation, the Lawrence School Committee, Andover Bread Loaf, Poets Laureate from both Andover and North Andover, a dance group called The Poet Tappers of North Andover, and several other residents, poets, and teachers from the area. Frost Hoots take place on the second Tuesday of each month at Cafe Azteca, Lawrence. There is either a featured reader or a theme and always an open mic. December’s featured reader is Dariana Guerrero.